Russia is returning to the big leagues of science by becoming a full-fledged participant in major international projects. One of them, an anti-proton and heavy ion accelerator, is headed by Boris Sharkov, a Russian physicist. After the end of the Cold War, serious physics—which had been largely associated with increasing military capability—lost a lot of its appeal. In recent years, however, serious science has become popular again. 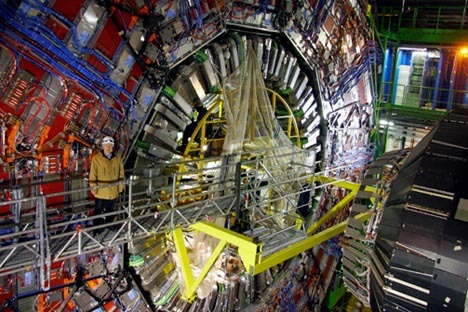 The CERN Large Hadron Collider has been launched, and controlled nuclear fusion work at Cadarache has gotten underway. Due to their ever-increasing complexities and costs, large science projects require international cooperation, and Russia is taking an active role. Russian scientists and engineers are playing an important part in the administrative and scientific structures within these projects. Last October in Wiesbaden, Germany, nine countries, including Russia, signed a convention to establish a new accelerator center, FAIR (Facility for Antiproton and Ion Research in Europe), which will be built in Darmstadt, Germany; 16 states are expected to participate in the project. Boris Sharkov, who serves as deputy director of Science Activities at the Institute of Theoretical and Experimental Physics (ITEF), sat down with Ekspert to talk about the FAIR project. Ekspert: Why is the FAIR project needed? How are its objectives different from those of the Large Hadron Collider? Boris Sharkov: The Large Hadron Collider is a set up meant to study elementary particles, high energy physics, and it has the very concrete objective of discovering the Higgs particle. There is a huge field of science, however, that investigates the formation of stellar matter. The important thing is that heavy colliding particles engender an extraordinary state of matter found only in stars. Now we have a chance to study this state of matter in the laboratory with large amounts of statistics and huge data volumes while creating matter parameters that occur only in neutron stars, during supernovae explosions, etc. E: Why is the FAIR project being established in Germany and specifically in Darmstadt? B.S. : They have the experience and the manpower. The FAIR project’s establishment proposal was put forth in 2003. In 2006, a basic technical report was issued that can be called a scientific and technical assignment for project construction. About 3,000 scientists and engineers from 47 countries took part in its development. The setup to be constructed is six times greater than the GSI accelerator. Its basis will consist of two superconductive rings housed underground in one tunnel, and a whole set of storage rings that form particle beams with the parameters required for experiments. The overall length of the accelerator is approximately four to five kilometers. Particle feed lines for the experiments are about as long. This project accumulates the world’s latest achievements in acceleration technologies, which allow to obtain very high quality beams. B.S. : Beams of all heavy ions from the periodic table, up to uranium; beams of protons and antiprotons. This antiproton accelerator will be a hundred times more intense than all currently existing accelerators combined. E: What practical results do you plan to obtain from this accelerator? B.S. : This lab will be the base laboratory for the European Space Agency. The duration of all manned space missions is limited due to space radiation’s effect on humans. Our project plans to study not just the biological response to space radiation exposure, but also exposure at the molecular, genetic and DNA structure-changes levels. Besides medicine, there will be unique research on heavy ion nanotechnology: New materials and new structures can be obtained by irradiating various materials with heavy ions. The third practical application involves super intensive, record-breaking intensity beams of heavy ions that, being focused on matter and decelerating in its bulk, form dense non-ideal plasma. This is a substance with a solid-phase density, but at colossal temperatures. This is just the thing that interests our nuclear energy sector, since many materials in various reactors and in special designation systems are acted upon by ionizing radiation. And we must know how materials behave under such conditions. E: What will Russia get from participating in this project? B.S. : I was recently at a European meeting in Barcelona where a road map for European science infrastructure development was discussed. The participants defined a mission of basic science, which, besides obtaining new fundamental knowledge, includes driving new technologies. The point is that the construction of such setups requires new materials with fundamentally novel properties and new technologies, including information technology. They are required because the data flow will exceed that at CERN by a minimum factor of 20, for the simple reason that we have much more particles and events. And we also have to set up the relay of this information stream to Russia. This will require the creation of information technologies at a completely new level. Most projects at this level become international. Refusing to participate in them is remaining at the periphery of modern science and technology. In 2008, we established a FAIR research center in Russia, which allows for all Russian participants in this project to interact: ITEF, the Academy of Sciences, Rosatom, all the universities, – and Germany. It is funded by us and the Germans on a 50-50 basis. Thirty-two fellows were selected for this center with the help of an international selection board. We have one condition: They must work in Russia. This project will favor the retention of talented young scientists in this country. E: Another accelerator complex, NICA, will be constructed in Dubna, and its characteristics are in no way inferior. Aren’t we competing with our own projects here? B.S. : The late director of the Dubna center, Alexei Sisakian, who was a close friend of mine, was at first wary that there would be a competitive struggle between FAIR and the NICA project. But I convinced him that these two projects are complementary. NICA is a collider—an accelerator where particle beams collide; FAIR will use fixed targets. Besides, the intensity and capabilities at FAIR, energy-wise, will be a generation ahead. Now I am heading an expert board for the creation of the Dubna apparatus, while being a scientific director at FAIR. Moreover, Dubna is a participant in the FAIR project. In Germany, the demand for some of its developments is quite high. The accelerator at FAIR is built using magnets developed at Dubna. When Russia and Germany signed a declaration for Russia’s participation in FAIR in 2008, the agreement stipulated that 85 percent of the funds invested in the project by Russia would be returned to Russia, to the institutes participating in the project and the high-tech industry. And since Russia is one of the joint owners of this project, it will own all that is done as well. Russian money is actually being invested in Russian institutes and technologies. As of now, this is the only international project using such a framework. E: How much does the FAIR project cost? B.S. : The total cost of the project to 2025, including operational costs, is estimated at three billion euros. Of course, this is not much. Three billion is the cost of half of an atomic submarine or a bridge across the strait between Scandinavia and Denmark. Billions of dollars are handed as bonus packages to banking magnates in America each month. You see what I’m getting at?